The coat of arms of Walachia origin must be sought in the battles waged for independence by the first Romanian state ever to appear. Once again, just like I did writing the Short and Comprehensive History section, I must point out the hard times Romanians had their entire history. Due to the lack of stability that the outer powers induces in the Romanian space, the most precious informations on the creation ("dismounting") of Walachia are given by the foreign sources. On these early decennia after the state birth of the principalities, and even on the first century sometimes, we have to rely on documents kept in the Hungarian archives or libraries of even farther states (the Papal States for instance). Some tombstones in Romania bear precious information but no paper or parchment sources of the early days of being were kept. Most of the old letters issued by Romanian princes are known because the addressees saved them from destruction, although accordingly to the time customs each sent letter was to be copied and kept like back up in order to keep track of the foreign affairs. Romanian archives suffered a lot. Even in the 20th century, the Romanian national Treasury, evacuated to the Russian ally in 1916 (or 1917) - since Russia underwent a communist revolution meanwhile - returned just as fragments and only after long negotiations with the Russians denying its existence. We know from the Hungarian sources that several small voivodships existed south of the Carpathian Mountains in the early 13th century and late 12th. Basarab the Founder (ruler since 1310, according to an internal source not entirely indisputable, and until 1352 - the second year is trustworthy) asserted masterdom over the Romanians of all this small states south of the Carpathians that depended of Hungary and the Tartarians, sometimes of both. We know for sure that he completely defeated the Hungarian king Charles Robert of Anjou (1308-1342) in a gorge inside the Walachian mountains in 1330, thus achieving independence for the state he created. Basarab used both the fact of Hungaria being weakened by the Tartarians and the dynastic struggles that finally brought Charles Robert on the throne as the first of the Angevin dynasty. 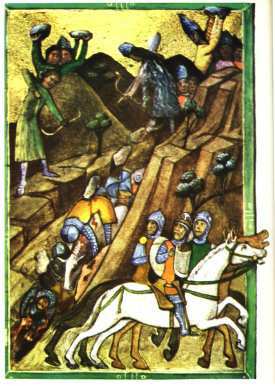 The Painted Chronicle of Vienna is the most precious regarding that fight in 1330 at Posada, picturing sheep wool headdressed Romanian battlers that from up the cliffs mash with boulders and pierce with arrows an iron clad army of knights trapped inside a gorge. 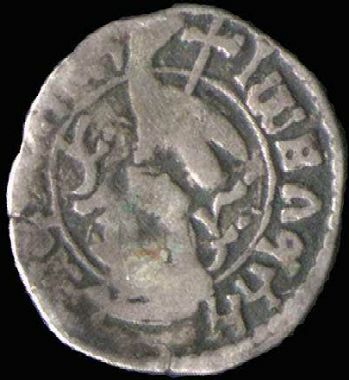 Let us see the first heraldic representation of Walachia known yet, on the coins of Vladislav (Vlaicu) I (1364 - ~ 1377), and how we relate it to the battle mentioned. Vlaicu I is the grandson of Basarab the Founder and the first prince known to have stricken coin. Maybe there were other previous issues, it is fair to expect, since unknown Moldavian coins of the 14th century were discovered just a few years ago inside a hidden hoard, but let us rely on the picture above and explain it. We have a vulture (bird of heights) sitting on a broken helmet - to me it seems blood is flowing down its talons but I do not insist on this too much. The word vulture, as presented by the Webster Dictionary, means a naked neck scavenger, but in Romanian "vultur" signifies any large bird of pray (of the family Aquilidae), not particularly related to corpses. The word comes from Latin meaning "something that tears". I would rather did not use "vulture", but aquila is not used by English. The relationship with neighboring Hungary during Vlaicu I were strait and so must have been earlier. The king said that Vlaicu "following the bad habits of his father" took the title of Ruler, without "recognizing us as natural master". The memory of the battle of Posada in 1330 was still fresh and remembered as the stepping stone of independence, so nothing could remember better to anyone that Walachia was free and unhampered than the fact that Hungarian knights died in Walachian mountains being eaten by vultures. It is easier to assert, many historians did, that the aquila as Walachian coat of arms is the ensign of the Roman Empire, the Roman aquila (eagle) inherited along many other Latin elements by the Romanian culture. On one hand this justification is too facile, the eagle being a largely spread heraldic furniture on coat of arms all over the world (the Arab states use it, for instance), on the other the vulture was depicted as in the picture before, with the wings gathered, and just lately appeared wings spread as used today. The coat of arms appeared on coins in the shown manner for over one hundred years. As time went by the meaning must have been lost little by little. Already in 1390 there is known a princely seal on which the same vulture is pictured, but it is not perched on the helmet anymore. 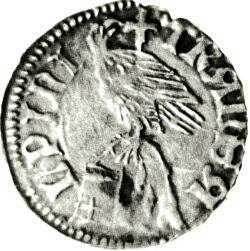 The quality of execution for the Walachian coinage weakened never to equal again the one of the Vlaicu's coins. It seems like the pattern was always copied from a piece in circulation, without really being engraved again by the hand of an artist. The contrast between an older and a newer coin is quite striking. Speaking of numismatics, it is very educational to learn what importance the coins themselves had for the coat of arms. As you must check on the picture of the silver denarius issued by Vlaicu I, the coin legend TRANSALPINI is separated by a cross, the cross showing the point were you should start reading. Both sides have legends, so they both display a cross. The cross thus placed and used is a common feature of all the Romanian coins issued during the Middle Age (take a look at our medieval coins in the Medieval coins section or just click here for a gros of Stephen the Great and the Holy). 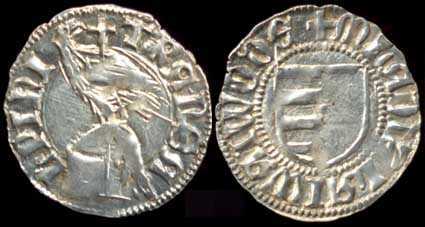 Maybe other medieval coins had the same feature too. Now, pay attention to the vulture beak that almost touches that cross. This numismatic impression was so aesthetically striking that the coat of arms was represented from a given moment on as a vulture next to a cross, just like on the coin pictured. Latter on, the vulture (or the eagle, if you like) hold the cross in its beak, and so the things stayed up to now. The astral elements, a sun and a waxing moon, joined the Walachian coat of arms following the cross. Starting from the second quarter of the 16th century towards the middle 18th, the Walachian coat of arms altered as memories faded and primal significations alike. Moldavia was "dismounted", as I pointed, by Romanians come from Transylvania, and so the Walachians became to be convinced it had happened to their principality. That explains for lack of documents, crucial data about Basarab the Founder being known due only to researches undergone in the last two centuries. A legend emerged and that itself became corrupt after a while with the legend of Matthias Corvinus, famous Hungarian king whose father was the nothing less famous Romanian Iancu of Hunedoara. As consequence the Walachian vulture became confused with a raven ("corvus" meaning "raven" in Latin, "corvinus" "raven like". After the second half of the 16th century the vulture became to be represented more and more often in an ambiguous manner that left the possibility of two interpretations, raven or vulture either. The heraldic bird began to spread its wings also until reaching the completely stretched wings state known today. The raven corruption due to the false legend brought in the beak of the already now raven a ring, sometimes two persons aiming a bow to the bird to bring it down, just like in the Hungarian legend where a thief raven was pierced by an arrow. Toward the end of the 18th century the confusion disappeared, but for a long time the Walachian vulture was transformed in a raven just like latter on the Moldavian urus became confused with a wisent. Thanks for reading. If you find some of the information available on our site useful and employ it inside a paper, article, web page or whatever else, please send us a note at the following e-mail adress: romaniancoins@yahoo.co.uk so we could tell our enemies and they die of envy!